Today we announced a strategic partnership with WONDERLUST. We’re really excited to kick off 2019 by working with the top notch team over there. Read the press release here. Take a look at the world from the WONDERLUST perspective at wonderlusttravel.com. Thank you for your support and for joining us in another exciting year ahead! Write Letters/Postcards To Yourself Take time to write a quick summary of the day on a postcard and mail it home. You’ll get to re-live your mental state and where you were at in life during different parts of your journey. Collect New Recipes Capture all of the different kinds of food and flavors you experience on your trip by bringing back a new recipe with you every time you visit a new place. Just take a quick snapshot of your favorite food and drink menus that inspire you. That way you can enjoy these new flavors at home and share them with others. A TUG robot hard at work at a new Sheraton hotel in Los Angeles. How would you react to a robot showing you to your room? How about if a robot answered the door when you called for room service? 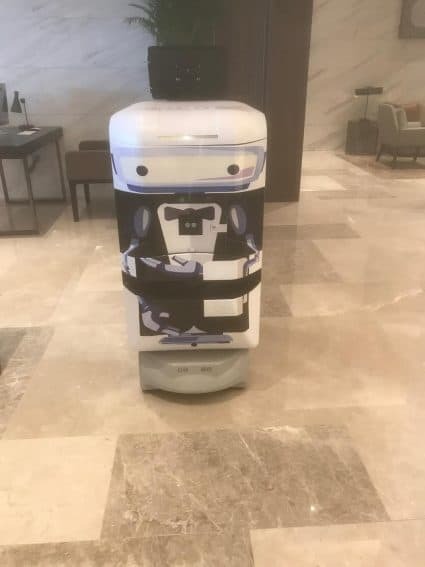 This is already happening at some hotels in the US, and inevitably, if trends continue, robots to help with simple tasks like these will be a part of every large hotel in the years ahead. It all started with hospitals. The Tugg robots that have been used for several years to monitor patients and distribute medications have morphed into the hospitality business. A story on GoNOMAD.com detailed this latest trend. “Ahead of their time, the brand new Sheraton Los Angeles San Gabriel is paving way for a new generation of hotel experiences, and memorable ones at that. This new hotel has eight of the robots working in various capacities, from showing guests to their rooms, to helping deliver room service requests for guests, said Wanda Chan, general manager of the Sheraton LA San Gabriel. And on the East Coast, the innovative Yotel hotel chain has also employed the shiny new aluminum employees, first as a novelty and now in a similar capacity as the Sheraton. It started at Yotel with a robot that fetched luggage, called the Yobot. This robot has been around since the hotel opened in 2013, and stays behind a glass wall. At the Yotel hotel in New York, the ‘Yobot’ fetches your luggage. Now the UK-based chain is taking their robots to a new level, with a pair of room service robots in the newest property in Singapore. Need extra towels, or more hangers? One of them will bring it to you. They’ve learned how to operate the elevators and can navigate all over the different floors for guest rooms, delivering to the cabins and singing songs as they depart. If a high-tech servant like this is something you’d like to experience, book a hotel in Singapore with Bonwi. Use the points you gain from any stay to use for a future car rental or another hotel. With or without a robot to serve you.